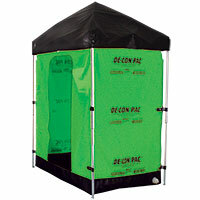 The most cost-effective, instant, modular decon units and shelters on the market! Our De-Con Pac™ can be set up anywhere in all weather conditions as a single unit or staged as a multi-station mass decontamination system. We now manufacture all standard Pacs in “De-Con green.” These are the same liners you have come to rely on from Andax Industries with the same top quality and durability. Please call us with your comments or questions at 1-800-999-1358. Emergencies don't just happen in nice weather. 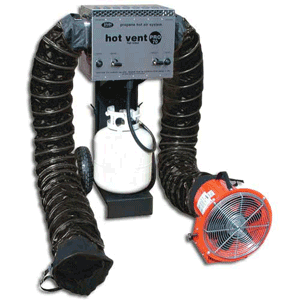 Manage the situation for the victims and the responders with air shelter heaters and shower water heaters. 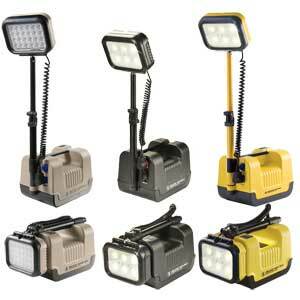 These easy, portable heaters are propane powered for in-the-field use. Simple design allows for convenient fast deployment and activation. Large-scale contamination is the stuff of nightmares. No one wants to think about a river of noxious liquid streaming from a ruptured tank at a chemical plant or an overturned semi spilling hazardous material onto a highway, yet you have to be prepared to respond whenever and wherever such an emergency occurs. You need to be capable of getting your decon equipment to the site and the victims in a timely fashion. 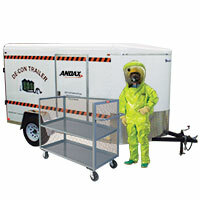 Andax's De-Con Trailer and Mobile Deployment System Carts get your decon equipment to the scene.